« The Mirror of Yu-Huang by Christine Norris Giveaway Winner! Sounds like a good book! What is the reading level (age range). Looks like a delightful family read! I Liked Lee & Low Books on Facebook. I would love to enter! 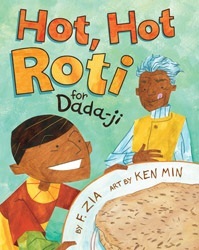 I have always tried to expose my kids to ethnic foods and I LOVE Indian food. Still working on getting them to enjoy curry but nann and roti go over well! Fun book. Children will enjoy reading about other cultures and their foods. I followed on book connection-surprized I hadn’t followed before this? ?